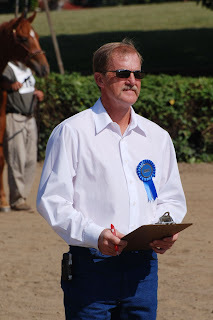 Dr. Ellen Stephens’ bay colt by Dance With Ravens, out of Clear Vision by Chromite was named Grand Champion of the 2008 Virginia Breeders Fund Yearling Futurity August 24 at the Warrenton Horse Show Grounds. 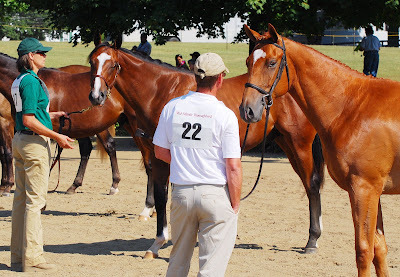 The Clear Vision colt (center below) won the Colts & Geldings Division, earning $3,000. Laurel, Inc. bred the colt. Mr. and Mrs. Frank Zurich’s and Mr. and Mrs. George Ryaborn’s homebred filly by Value Plus, out of Gilded Ivory by Gilded Time won the $3,000 top prize in the Filly Division as was awarded Reserve Champion. The Grand Champion is by Dance With Ravens, a graded stakes winner in Canada of over $340,000, who stands at Northview Stallion Station in Maryland. He is by A.P. Indy, out of Dance Smartly by Danzig. Dance With Ravens first foals are yearlings of 2008. The winning colt is ouf of the winning mare Clear Vision who earned $9,479 at the racetrack. She is a half-sister to $536,354 stakes winner The Exeter Man, and Brazilian graded stakes winner =Icy Wind. At stud, Clear Vision has produced five winners including $184,018 winner Lasik (Mazel Trick), The End Is Clear (Precise End) a winner of $110,018 and the course record setter Leading Brave (Indian Charlie), a winner of $49,815. She has also produced Path to Perfection (Precise End) a winner of $68,283 as well as the winner Otherpeoplesmoney (Patton). She has a two year old colt by Black Tie Affair, and was bred back to Stephen Got Even this spring. The Reserve Champion filly is by the seven-year-old Stonewall Stallions (KY) stallion Value Plus. 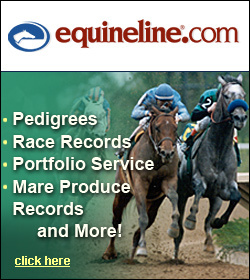 Value Plus is by Unbridled Son and a stakes winner and graded stakes placed winner of over $414,000. He was second in the Futurity Gr.1 as well as the Florida Derby Gr. 1). At four, Value Plus won the Artax Handicap in track record time defeating Gigistar. His first foals are also yearlings of 2008. The dam of the Reserve Champion, Gilded Ivory is a winner of $44,745. She is half-sister to the winners Coolasacat ($172,394), Mount Cavell ($63,881) and Mesopotamia ($32,375). Her dam Mesappiano is a full-sister to graded stakes winner and multiple stakes producer Funistrada. At stud, Gilded Ivory has produced four foals including $8,715 earner Mach Z (Macho Uno). This spring she was bred to Cozzene.